My brakes gave out a few weeks ago, and after getting a $1,058 bill, it looks like my ’99 Accord is done for. While I’m looking for a replacement, my wife and I can usually carpool, but on a couple of occasions, I’ve had to take an IndyGo bus to work. Because the infrequent stops tripled my commute time, I wouldn’t choose to ride again without more rapid public transit, despite having a bus stop just a block from my house and a gleaming new transit center downtown. But for the more than one in three Marion County residents who live below economic self-sufficiency, there may not be a better choice. The lack of reliable frequent public transit can mean that a breakdown or repair bill can cost them a job and threaten their family’s well-being. However, the Central Indiana Transit Plan would provide thousands of dollars in annual savings for working families while opening the door to better jobs, education and services. That’s why I believe the transit plan would help unlock economic mobility for Indianapolis residents and boost the economy of the entire region. According to a new policy brief by the Indiana Institute for Working Families, the transit plan would help low-income working families by transforming Central Indiana’s public transportation system into a tool for economic mobility. In Indiana, a family of one adult, one preschooler, and one school-age child must currently spend $255 per month to own and operate a car. In similar-sized cities with adequate public transit, monthly transportation costs are much lower: for the same family in Denver, it’s $140; in Seattle, it’s $99; in San Francisco, it’s $76. But the key isn’t just transit; it’s the public investment that makes transit frequent and reliable, not a system of last resort for the most disadvantaged. There’s a reason why 32% of Marion County’s public transit commuters are currently in poverty, and why their median annual income is just $12,925 (barely above the poverty line for one) compared to a county median of $30,821. For a working family in Indy whose income isn’t enough to meet basic expenses, taking the bus sounds like an attractive alternative, but lack of access and long wait times keep it from being a long-term answer. Under the current system, a family needing a stop for childcare on the way to and from work could easily spend up to two hours a day just waiting for the bus. The proposed transit plan would not only increase coverage of frequent routes for impoverished residents from a current 16% to a projected 51% by 2021, but by cutting waiting times it would also reduce the financial and opportunity cost of transit for working families. The net benefit of the transit plan for working families would far exceed the 0.25% county economic development income tax rate on the ballot. For the 58% of Marion County households who earn less than $50,000 per year, the tax increase works out to $7.33 or less per month, according to analysis by the Institute for Taxation and Economic Policy. But as a result of more efficient transit, working families could see a net savings of $158 per month for one adult, one preschooler and one school-age child, for an annual saving of $1,896. That’s more than a semester’s tuition at IvyTech. 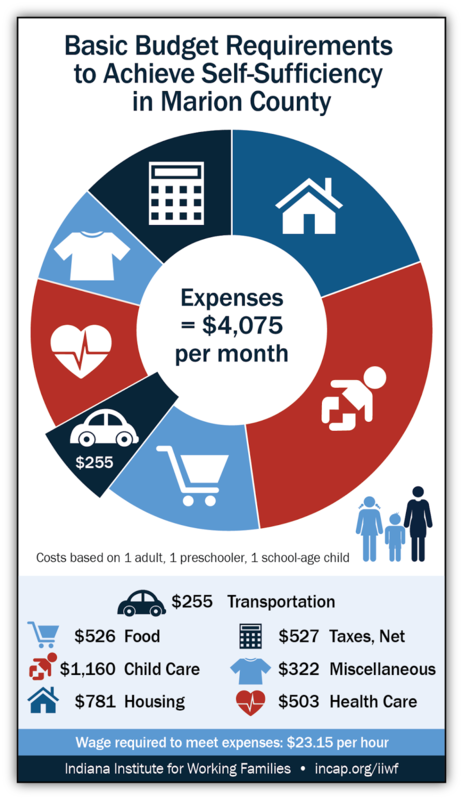 For two adults with one preschooler and one school-age child, the monthly net savings would be $315, or $3,780 per year. The savings for this family equates to about 70% of the cost of family child care for a preschooler and a significant step towards keeping both parents secure in work. Even for residents who don’t plan to commute with expanded transit, the Central Indiana Transit Plan is a clear winner. For employers, the plan will open more workplaces to a workforce that won’t be sidelined by a brake repair (like mine). Residents will have better access to parking-restricted sporting events and cultural celebrations. And everyone in the Central Indiana region will benefit from an economy boosted by the increased incomes of working families who have the mobility to get to better jobs, better educations, and better skills.